A new body of work accompanied my research as part of my CRATE Curatorial internship. Tthis page will be used for artists i’m engaging with and interviewing. 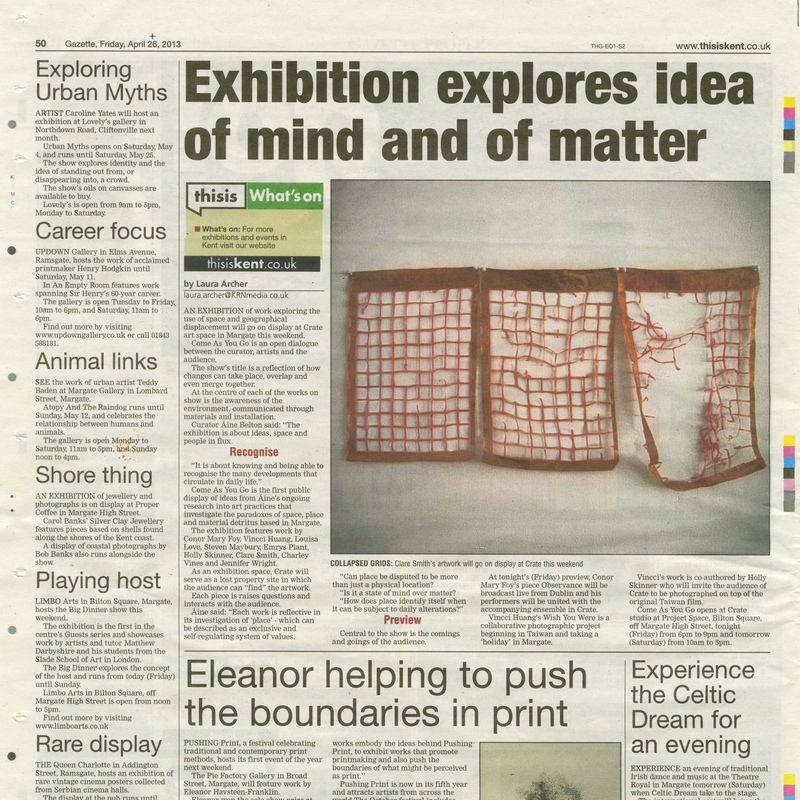 Here’s the first show I curated back in April 2013 with my felt-time research – this research project is on hold for 2015. Featuring: Conor Mary Foy, Vincci Huang, Louisa Love, Steven Maybury, Emrys Plant, Holly Skinner, Clare Smith, Charley Vines and Jennifer Wright. Come As You Go is an exhibition about the use of space and materials inspired by geographical and temporal displacement. It is an open dialogue between the curator, artists and most importantly the audience. The title is recognition of how changes can take place, subtly overlapping and blending in with each other. It is about knowing and being able to recognize the many developments that circulate in daily life. At the center of each of these works is a sense of awareness of environment seen through materials and installation. Crate acts as a host site for these works that are comfortably unhinged. Come As You Go is about ideas, spaces and people in flux. The exhibition will serve as a temporal document framing the works as they are in situ.It is not about start or end points; it is simply about knowing, about being aware and continuously observing. Each artist shares their own insight about the experience of being in flux with materials and surroundings. The site of Crate will serve as some kind of ‘lost property’ – a space for all kinds of objects and materials to be found, a site of transience and crossing layers of existence. It will serve as a site for random interventions, juxtapositions, meetings, concoctions and the unknown. It will evolve throughout the opening night as artworks unravel and shift about. The conversation between the works selected is one of irregularities and re-representation. Not only will the works be representative of the uncertainties of location and matter, but of communication and distance. Each work is reflective in its investigation of ‘place’- which can be described as an exclusive and self-regulating system of values. Can place be disputed to be more than just a physical location? Is it a state of mind over matter? How does place identify itself when it can be subject to daily alterations? The comings and goings of the audience are a key element of the preview. Several of the works featured are by three artists that will only have virtually visited the site. Such artists rely upon the audiences’ interaction to complete the works in Crate. Conor Mary Foy’s piece Observance will be broadcast live from Dublin uniting his performers with their counterparts in Crate. Vincci Huang’s Wish You Were is a collaborative photographic project beginning in Taiwan and taking a ‘holiday’ in Margate. Co-authoring this work, Holly Skinner invites the audience of Crate to be photographed on top of the original Taiwan film. The preview of this exhibition is the work in progress for the audience to experience and participate in. Come As You Go is the first public exchange of ideas from Áine Belton’s ongoing research into art practices that investigate the paradoxes of space, place and material detritus based in Margate. Arts Council England and Kent County Council.